Pongal celebrations are not yet over at my place. Yesterday was the first day of Pongal and I prepared Sweet Pongal and Urad Dal Vada. I went for simple recipes, since I felt very tired after cleaning home for the last 2 days before Pongal That's the reason, I could not take pictures of the Sweet Pongal and post it over here. Hopefully I will be posting it soon. Fine, I will come to today's recipe now. 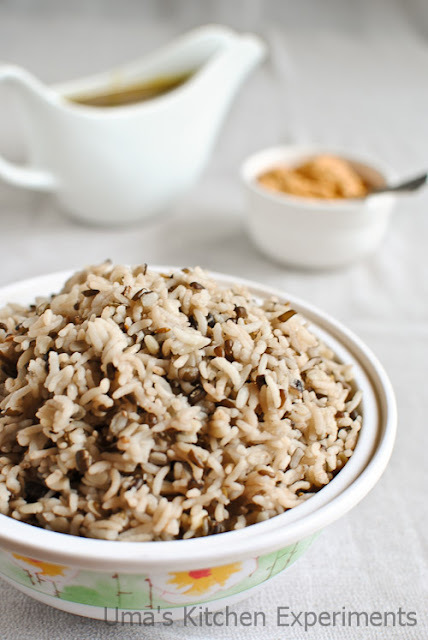 Urad Dal Rice / Ulundhu sadham is often prepared at our home either as rice or as a porridge with few changes. Both dishes taste really good but I always prefer the first one. You can gain all the health benefits from Urad Dal, garlic and cumin seeds as all the ingredients are cooked without oil. Try it out! 1) Wash the rice well and soak it in water for 30 minutes. Meanwhile, wash the urad dal well in water for 2 or 3 times. Peel the skin of the garlic. Keep both the ingredients aside. 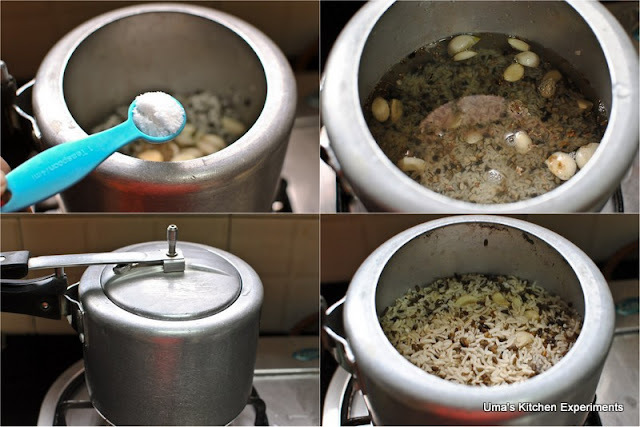 2) After 30 minutes, drain the water from rice and add it to the pressure cooker. Add the washed urad dal followed by the garlic cloves. 3) Add cumin seeds, salt, fenugreek seeds, gingelly oil and water. 4) Close it with the lid and cook until 3 whistles. 5) Wait for the steam to suppress and fluff off the rice using fork. 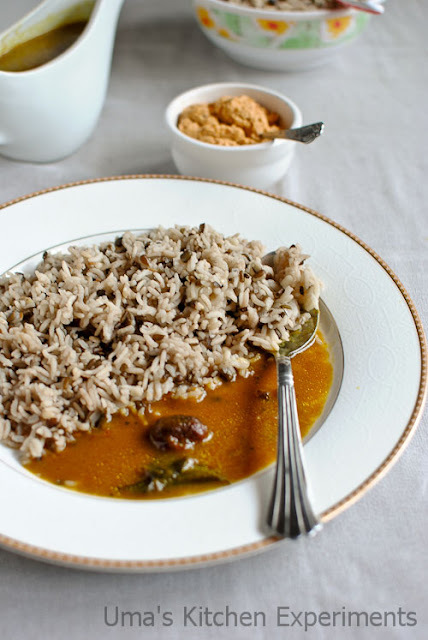 6) Serve hot with Puli kulambu(Tamarind gravy) or Vatha kulambu and ginger coconut thogayal or sesame thogayal. 1) Garlic quantity can be reduced or increased as per personal taste. 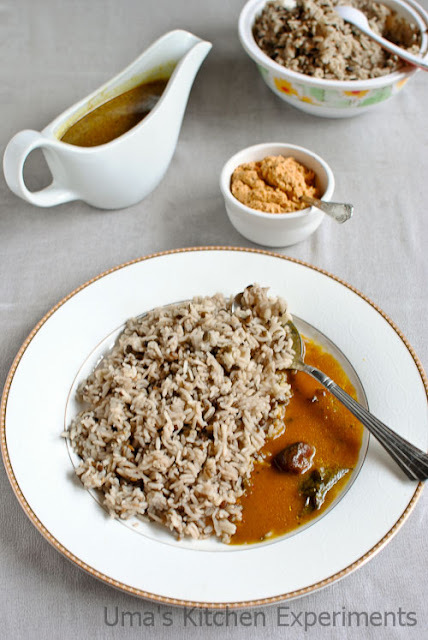 2) This rice can also be cooked with urad dal without skin. But Urad dal with skin gives nice color and taste. 3) The entire cooking can also be done without pressure cooker. Uma this is new to me,sure healthy recipe. i love simple dishes which let the main tastes shine. i havent had any urad dal rice before. i should definitely try a version soon! Very inviting and well done. Amazing click very professional. New recipe to me..healthy and looks yumm! 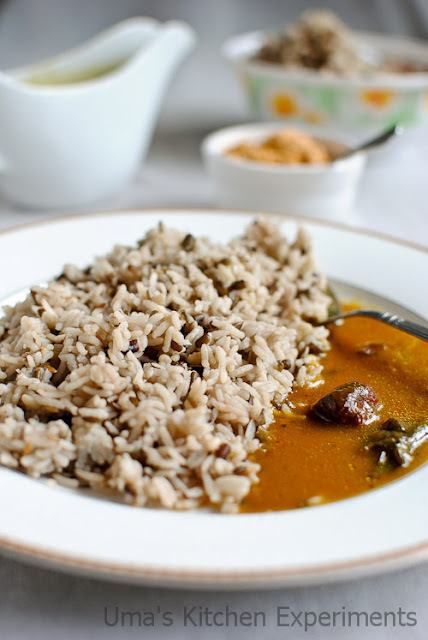 One quick question, can we use the whole urad dal(with skin) for making this rice? I will try with that. Had it long back at grandma's place, missing this healthy,nutritious rice. Healthy rice. My mom often makes this. @Mahi, It tastes good only when you use split Urad dal. 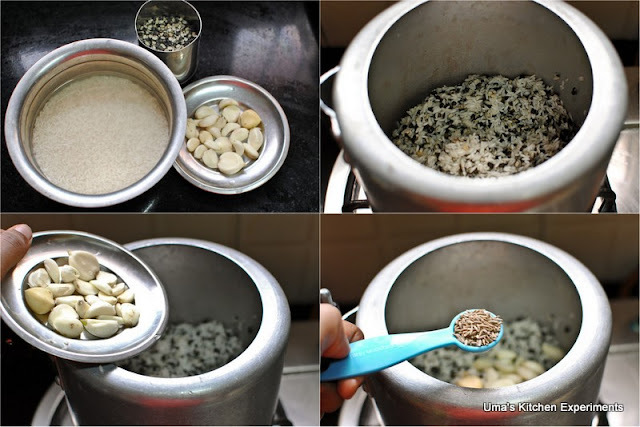 If you don't have, you can use split urad dal without skin. I never tried it with whole black urad dal till now. Sounds healthy,inviting clicks...new to me,will try it for sure..bookmarked. very interesting recipe, love this simple n healthy rice...inviting pics Uma, esp the last one is too good! Sounds and looks so healthy and flavourful too!